ET Indecor is Responsive Joomla! template that targets for Interior design websites. Interior Design Joomla! Template is perfect solutions which is specifically tailored for this purpose. Interior design is a business niche that combines style and elegance with furniture and interior spaces. Interior design Joomla! 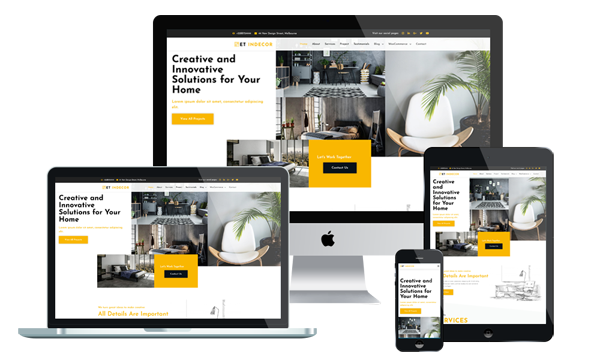 template is built with interior design in mind, to showcase the work of interior designers and decorators, or for those building a website about interior designs and inspirations. It means if you know how to convince them, you can have a constant flow of clients. In this business area, images usually say more than words. These fantastic themes promote high-quality photos, depicting fantastic settings and introducing the client a world of home relaxation and harmony. Also, the colors used for menus and background are perfectly integrated with the images and content organization. Important areas of your site are subtly highlighted using colors and fonts. Also, the stock images are integrated into the package, simplifying the customization process. Interior design Joomla! template supports mobile devices with 100% responsive layout. It also builds with latest Bootstrap CSS Framework, Support Font Awesome and K2 extended style. It comes with flexible homepage which drag-drop layout and full-width layout, strong shortcodes, unlimited module position, and has drag-drop tools and color settings helping to create unique websites with various layouts. Besides, it is also included 4 color schemes and boxed layout to make your template look more motivated and attractive. For a much lower price than professional web design and full of coding skills, these allow you to have your own site in a matter of minutes, without sacrificing the quality of the design.